Great Nicobar Island Nicobar Islands. 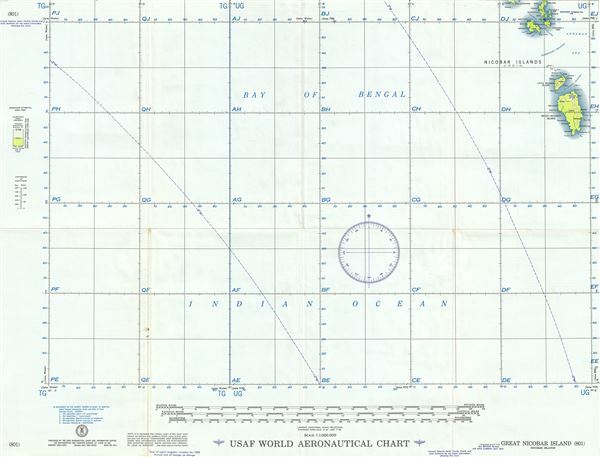 This is a fine 1954 U.S. Air Force aeronautical chart or map of the Great Nicobar Island and vicinity, part of the Nicobar Islands of India located in the Indian Ocean. It covers the Camorta Island, Nancowry Island, Katchall Island, Little Nicobar Island and the Great Nicobar Island. Important cities, rivers and roads are noted along with other hydrographical and topographical features essential for the air pilot. Verso of this chart features legends and a world aeronautical chart index. This chart was published by the USAF Aeronautical Chart and Information Center, and was issued as chart no. 801. First issued in 1949, this is the third edition revised to July 1954. Very good. Minor wear and toning along original fold lines. Minor spotting.